This Shhh is La Banane! 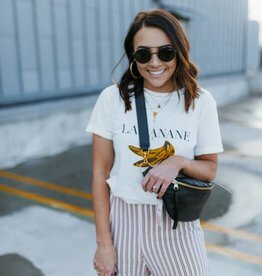 Add something fun to your white tee collection with this La Banane Tee! 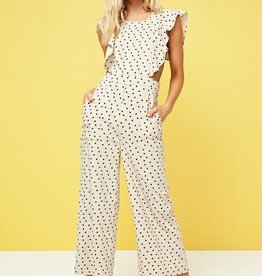 MINKPINK Pip Ruffle Jumpsuit the fun and flirty way to splash some style into your weekend brunch outfit. Wear it with a cute paiR of wedges to complete the look. The MINKPINK Josie Loose Knit Sweater is a must have for spicing up your cool weather wardrobe. The perfect little black dress. All over lace featuring a scalloped hem and a button keyhole back. MINKPINK Striped Knit Midi Skirt. Wear it with the Striped Twist Front Tee to complete the look! C'est chic! The Lena Top featuring a flare sleeve is the classic stripe top you need in your wardrobe this season! The mini dress of your dreams. MINKPINK's Tangerine Dreams Mini Dress has a beautiful all over floral print with a ruffle hem detail. Super comfortable and easy to wear! Pair with some high waisted pants or a skirt and you're ready to go! The MINKPINK Daybreak Swing Cami is loose, comfy and stunning! Pair it back with the Daybreak Swing Pant for the easiest set dressing. We're ready for a vacation. The MINKPINK Paradise Scoop Bralet is here for you in a universally flattering shape with a cute tie front. Pair this style with the Paradise 80's Bottoms to complete this look. The Tencel Pants are your ultimate versatile wardrobe piece. Keep it casual paired with flats or dress them up with heels. The MINKPINK Daybreak Swing Pant are so lightweight and comfy, you'll want to wear them all day long! Pair them with the Daybreak Swing Cami for the easiest set dressing. The Tencel Smocked Crop Top is a cool and current style in a comfy material. Wear it with denim for effortless chic or complete the look with the Tencel Pant. Stand out in the MINKPINK Low Tide Tie Front Jumpsuit! This little number is too hot to leave behind. Add to cart now! Don't let the cold weather keep you from showing a little skin! The Easy Does It Skirt is great with any top and is trans seasonal! Your ultimate Summer Vibes skirt! The Baja Strapless Faux Wrap Midi Skirt features a cropped length and super cute ruffle detailing, making for the perfect flattering fit! Pair it with the Baja Strapless Layered Top to complete your look. Your ultimate Summer Vibes top! The Baja Strapless Layered Top features a cropped length and super cute ruffle detailing, making for the perfect flattering fit!